Finding a correct way to make the perfect Russian Julienne can be a really long journey of trial and mistake. 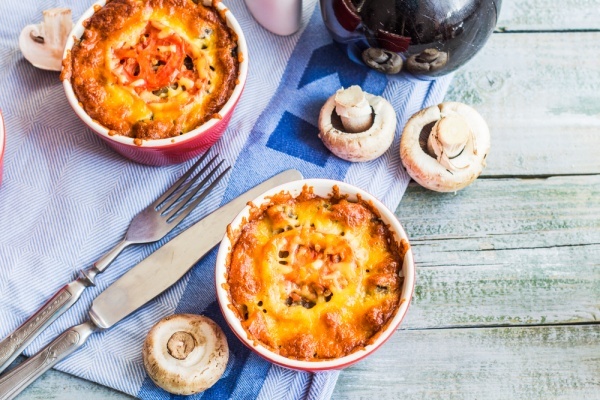 Kick off your spring dinner with this easy to make and deliciously tasty Mushroom Julienne with double cheese crust and tomatoes, albeit you can skip them. This Julienne is all-around wonderful, and everyone will love it – from adults to kids. In a large fry pan, add mushrooms and cook, stirring, until all the liquids evaporate. Keep the heat on high to speed up the process. Lower the heat, add a tablespoon of olive oil and a little bit of salt (to your taste) and cook for about 5-7 minutes, or until deep golden brown. If you love onions, you can add one sliced onion to mushrooms when you add olive oil. The taste will be much better. Place mushrooms into small baking dishes and let them cool a bit while you make the sauce. Heat the butter in a saucepan, add flour and stir well to avoid lumps. Cook until the white foam rises. Using a whisk, carefully stir in the milk. Keep stirring until the sauce thickens. Spoon sauce evenly over the mushrooms, place a slice of tomato atop, and sprinkle with plenty of cheese. Bake in a preheated oven to 400 F for 15 minutes. Garnish with the dill or spring onion.